With the simple name of this recipe “manchamanteles" (tablecloth stainer) we can imagine many things but it is difficult to know the real reason for which this name was assigned. And the answer is simple. This mole is so tasty that you are going to eat it fast and you will stain the tablecloth. Since this salsa is a mole you will find an infinity of flavors and aromas in it. Although unlike other moles, this one has the particularity of being made with fruits which fill of textures and of nectar the manchamanteles . 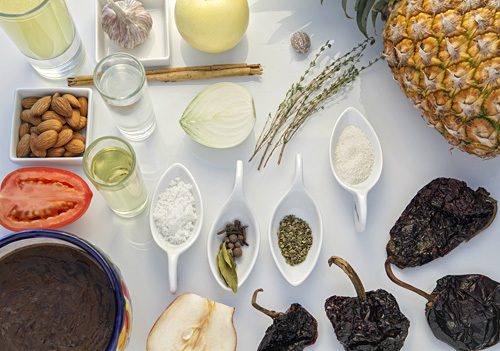 The origin of this recipe is situated in Puebla, land of moles. It is a deep red color salsa that can be combined with chicken or pork or even a combination of both. To enjoy it to the maximum also serve on the plate white rice and warm tortillas – and why not some of the fruits that were used to prepare the mole. The preparation of this recipe requires patience, kitchen experience and strong nerves. If you don’t have apple nor pear to prepare the manchamanteles, don’t worry because in the original recipe any seasonal fruit can be used like the apricot, peach, banana, etc. The only fruit that does result indispensable is the pineapple. The pineapple can be used fresh or canned. Prepare the manchamanteles with a homemade chicken stock so it has a natural flavor. The preparation of this mole takes 50 minutes . This recipe is for 2 qts. Cut the superior part of 8 ancho peppers, then reserve. Cut 6 tomatoes into quarters, then set aside. Finely chop 1/2 onion, then reserve. Separate the garlic cloves from 1 garlic head and peel them; then reserve. Put on a griddle over medium heat the 8 ancho peppers that were cut and roast them for about 2 minutes, until all their sides are lightly roasted; move them regularly with some tongs. Cover the chilies that were put in the bowl with warm water and leave them soaking for about 5 minutes, until they soften. Transfer from the bowl to a colander, with the tongs, the chilies that were soaked and remove the water excess; then set aside. Heat in a saucepan over low heat 3 tablespoons of vegetable oil. Mix the saucepan ingredients and fry them for approximately 1½ minutes, until the spices are moderately fried; move them regularly. Discard the spices that were fried and keep the vegetable oil in the saucepan. We only want the oil to aromatize and to have more flavor. Incorporate in the saucepan 1 cup of almonds and fry them over low heat for about 2 minutes, until they are lightly fried; stir regularly. The Ancho Peppers that were soaked. Mix the saucepan ingredients and fry them for about 2 minutes, until the chilies and the onion are moderately fried; stir regularly. The quarters of the Tomatoes that were cut. Mix the saucepan ingredients and fry them for about 3 minutes, until the garlic cloves are lightly fried and the tomatoes soften; stir regularly. 1 qt of Chicken Broth. 3 tablespoons of White Vinegar. When the broth boils reduce to low heat and leave the mixture cooking for about 15 minutes, until the solid ingredients soften and the broth reduces a bit. Transfer from the saucepan to a blender, with a kitchen spoon, the mixture that was cooked. Finely chop 1 apple, 1 pear and 2 pineapple slices without skin nor core; then set aside. The Apple that was minced. The Pear that was minced. The Pineapple slices that were minced. Mix the saucepan ingredients and bring the manchamanteles mole to a boil over high heat. When the manchamanteles mole boils reduce to low heat and leave it cooking for 4 minutes, until the fruits soften and they release their juice. * This mole will last up to 2 weeks in the refrigerator. Variation: Now taste the fruits in a guacamole. Did you like the Manchamanteles? Buy some ancho peppers of excellent quality like the “Don Enrique" so your mole will have the best flavor. Prepare the mole in a clay cazuela and you will see how the mole acquires another touch and another flavor. Cook this mole with a wooden spoon so everything is natural.